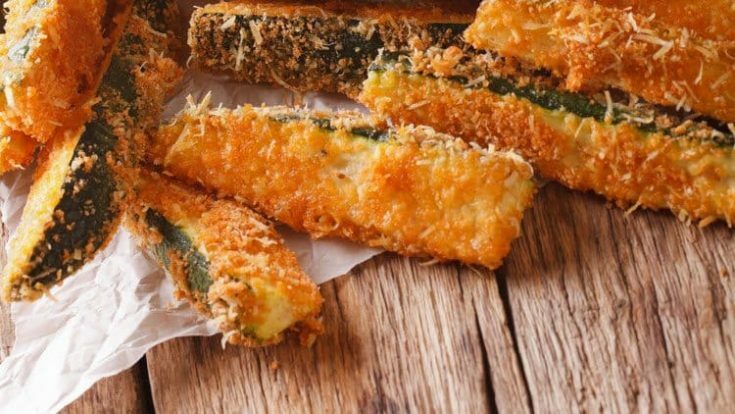 Making food like baked zucchini sticks from scratch is the only way to know exactly what ingredients you’re eating. That is unless you’re an expert label reader and you know what all the scientific sounding ingredient names really mean. Most of us don’t. I am newly interested in label reading around here because I’m almost 100% sure that my daughter has a gluten intolerance. And it was a long road to finding out that gluten might be the culprit to what ailed her. Let me give you a little background. My athletic and social 14 year old daughter pretty suddenly–or at least it seemed–started to have excruciating stomach pains accompanied by nausea and dizziness. Over the course of 2 months, we were at the doctor’s office multiple times a week, going to urgent care, ER, and specialists. We still have specialist appointments that we’re waiting for appointments for. The GI specialist ran all kinds of tests… upper and lower endoscopy, CT scan, blood work. Everything came back normal. The only questionable thing was that her small bowel seemed sluggish. However, no evidence of Crohns or Celiac, which were both diseases we thought possible. Then we went to a new Primary Care doctor, and she decided to take us in a new direction. She thought that the dizziness might be related to blood flow and that could also be the culprit for slower gut function. So, she put in a consult to Cardiology–who we are still waiting to see. I also mentioned to her that we had just started a gluten-free diet because we wanted to see if that might be the cause of all the pain. She thought it was a great idea. Notice–no doctor ever told us or suggested to us to try a gluten free diet–that was something we decided on our own because we weren’t getting anywhere and symptoms weren’t getting any better and the doctors weren’t really doing much to treat her symptoms. It was all very frustrating. My daughter has now been gluten-free for 5 weeks. At roughly 3 weeks without gluten she slowly started improving. She is still not 100%. We started using a lot of gluten-free products and I started cooking most of our meals gluten-free. Others, I would cook separately for her. We’ve been eating a lot of tacos with both Homemade DIY seasoning, which is gluten free, and a store bought Gluten Free Taco Seasoning. Black Bean Salsa with corn tortilla chips are another favorite, as well as hummus with Gluten Free flat bread or red peppers. She has some abdominal pain on and off, but nothing too severe at least for the past several days. Also, her dizziness has drastically improved. It had been to the point where we were having to walk her around the house because we were all afraid she would pass out and she was so unsteady. Even better, she’s back to school for the 1st time in 2 months. We were on the verge of having to do home-bound instruction and had paperwork into the Mayo Clinic in Rochester, MN to try to have her seen by their Diagnostic Clinic because we weren’t getting anywhere. The scary thing is–we still don’t know for sure what is wrong with her, but we do know that gluten seems to be a factor. I’m hopeful that that is all the problem is/was, because thinking that I can keep my daughter healthy by keeping gluten out of her diet is something that I can make work. It’s so much better than watching her suffer. It’s easier than you might think to make and buy gluten-free food. 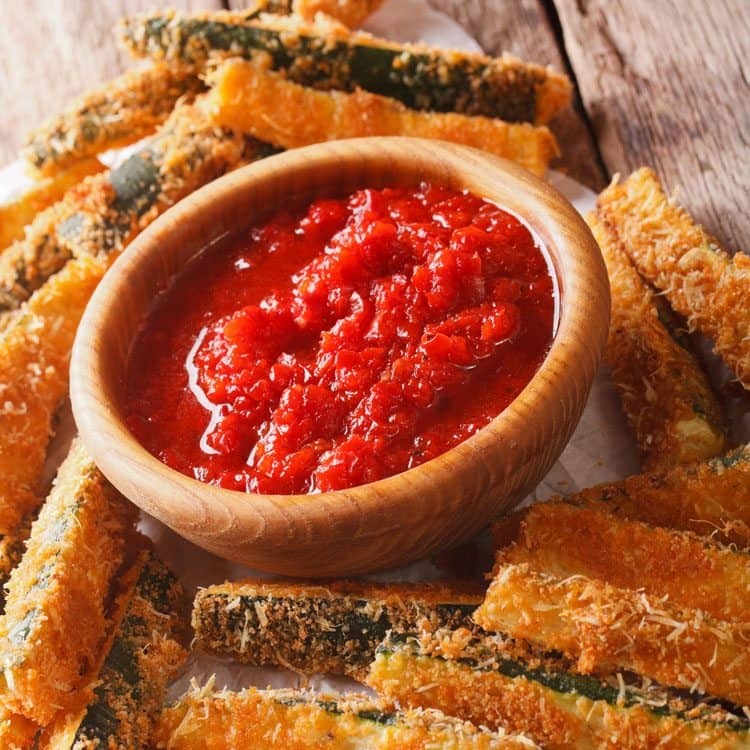 Making recipes like baked zucchini sticks is easy. We can also buy a lot of gluten free groceries online on Amazon’s Gluten Free Prime Pantry. There are all kinds of food available there and you can get free shipping with Amazon Prime…not to mention free movies and television shows. We also shop locally at ALDI, our local grocery store and a variety of other area superstores. I’ve gotten good at finding restaurants that have gluten-free menus before we go out to eat, because it can be stressful to go out to eat only to find that there isn’t anything on the menu that my daughter can eat. Thankfully, gluten-free is a current buzz word, a trend that has demand up for products to be free of ingredients that are unwittingly harmful to so many people. I’m hoping that my daughter continues to improve and that gluten is the cause of all her symptoms these last couple of months. It’s not fun, but it’s so much better than the many different alternatives. 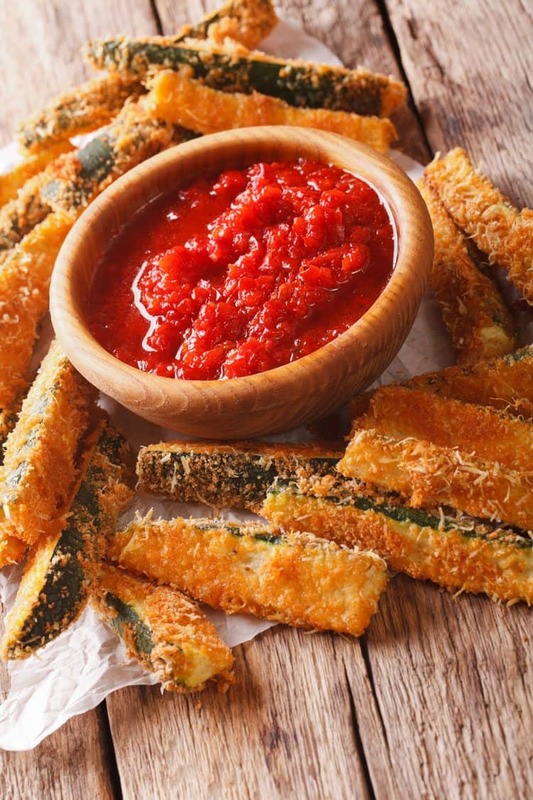 Yes, you can make baked gluten-free zucchini sticks. The only ingredient you really need to make sure about is that you are buying Gluten Free Breadcrumbs. The chili powder should be pretty safe, but I always double-check the ingredients and often use an app on my phone called The Gluten Free Scanner to make sure that a product is safe. My daughter uses that app and a second one in case a product isn’t listed. There is also Gluten Free Food Finder. You can also toss a tablespoon or two of dried Parmesan cheese into the coating to add some delicious flavor. Slice a zucchini into sticks and dip them into a beaten egg white with salt, pepper and some chili powder. Put 3 tablespoons. Italian bread crumbs into a baggie. Throw the zucchini sticks, a few at a time, into the baggie and shake until covered. Spray some Pam onto a cookie sheet and place the zucchini in a single layer and spray Pam on top. Bake at 400 for about 20 minutes, then broil for a few minutes to get them crunchy. Sprinkle with Parmesan cheese. Count as 2 points - 1 zucchini = 0, 1 egg white = 0, 3 Tbsp. bread crumbs = 1, 1 Tbsp. parmesan cheese = 1. It’s been a godsend! Thank you.